Kansas State University President Richard Myers will receive the 2017 Distinguished Service Award for International Statesmanship from the Kansas City International Relations Council on Thursday, Nov. 9. The prestigious award comes as the university kicks off its annual observance of International Education Week, Nov. 9-17. Myers will receive the award at the council's Global Honors Evening, which will be at the Gallery Event Space in Kansas City, Missouri. Several faculty, staff and alumni from the university's Manhattan and Olathe campuses will be in attendance. For more than 30 years the International Relations Council has annually recognized dignitaries and thought leaders who have made outstanding contributions in international commerce, diplomacy and education. Previous recipients of the award include Madeleine Albright, Janet Napolitano, Robert Gates and John Danforth. Myers is being recognized for his distinguished international career before becoming president of Kansas State University. Rising to the rank of four-star general in the U.S. Air Force, Myers served as the 15th chairman of the Joint Chiefs of Staff, the nation's highest-ranking military officer, from 2001-2005. In this role, he was the principal military adviser to the U.S. president, secretary of defense and the National Security Council. Following the Sept. 11 terrorist attacks, Myers helped design a military strategy to win the war on terror, forging strong relationships with his military counterparts around the world and uniting more than 90 nations in the effort. Myers also is credited with helping the nation prepare for new and emerging threats of the 21st century by helping transform NATO and ensuring U.S. military forces were prepared for joint operations. Before becoming Joint Chiefs chairman, Myers was vice chairman from 2000-2001, serving as key military adviser to the secretary of state and gaining diplomatic experience around the globe. His other significant commands included North American Aerospace Defense Command; U.S. Space Command and Air Force Space Command at Peterson Air Force Base in Colorado; Pacific Air Forces at Hickam Air Force Base, Hawaii; and the 5th Air Force at Yokota Air Base, Japan. As commander of U.S. Forces Japan from 1993-1996, Myers played a key role in ensuring and working the U.S.-Japan alliance, where relations with China and Korea figure prominently. He developed a deep working relationship with both civilian and military government leaders. After retiring from the military in 2005, Myers has continued participating in issues of international concern. He has made several high-level diplomatic trips to China; has been a recurring participant in the Tswalu Dialogue, a forum on issues of concern to Africa; and continued his ties with Japan as a founding participant of the Mount Fuji Dialogue, a biannual forum to discuss the current and future relationship of Japan and the U.S.
A 1965 graduate of Kansas State University with a bachelor's degree in mechanical engineering, Myers joined the Air Force through the university's Air Force ROTC program. As a command pilot, Myers logged more than 4,100 flying hours, including 600 combat hours. He has received numerous awards and decorations for his service, which include Legion of Merit, French Legion of Honor, and Presidential Medal of Freedom. 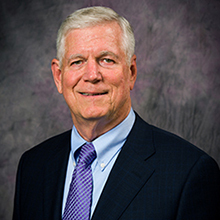 Named interim president of Kansas State University in March 2016, the Kansas Board of Regents made Myers appointment the university's 14th president in November 2016 following a national search.